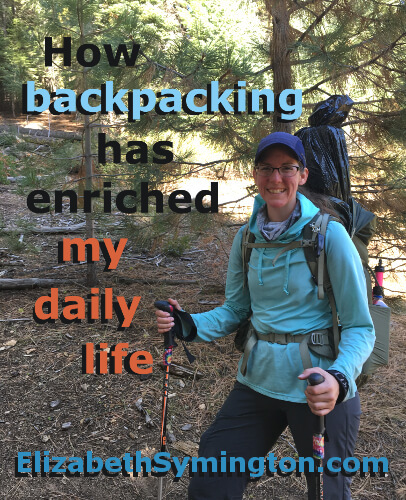 This is Day 2 of the 31 day series on “How backpacking has enriched my daily life.” I expected lightweight backpacking to be a hobby. Instead it has transformed me for the better. To start off with, let me briefly explain what is lightweight backpacking. In order to classify as a lightweight backpacker, your backpack, plus everything in it (minus food and water) would weigh between 10-20 pounds. Part of the philosophy about being a lightweight backpacker is to question everything. I am naturally good at that! Besides carefully considering what survival gear to bring, the amount, type and weight of the food is also very important to think about. Do I need to carry the extra weight of hydrated food or can I pack in dehydrated food? 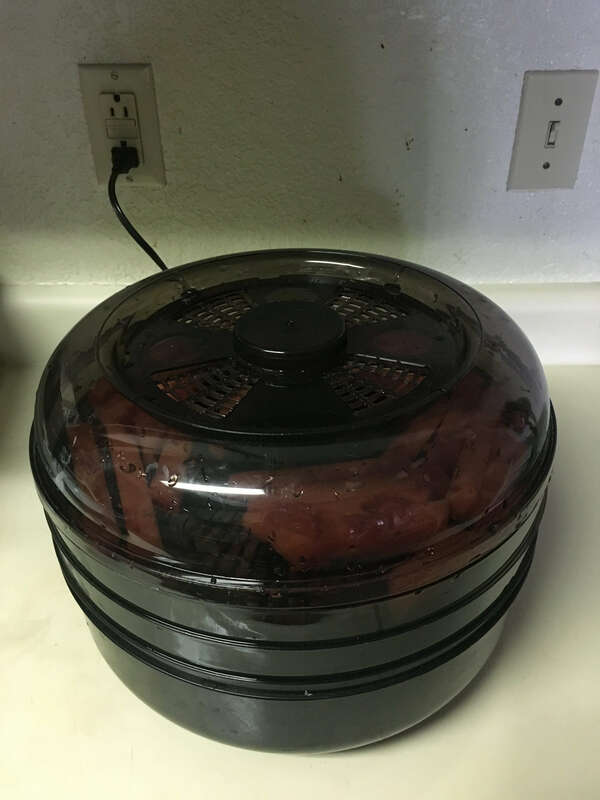 Backpacking is getting me into dehydrating food. I want to carry less food weight when backpacking and I’m excited to make myself snacks for everyday life. This is something that I’ve wanted to learn for years. I’ve even had the machine, but the whole process seemed way too intimidating. But now I am going for it! Earlier this summer while on a backpack, my friend Rachel told me a story about a time she met some fellow hikers on the trail and they offered her some homemade dehydrated watermelon. She said it was super refreshing. I’m naturally skeptical, so I’m going to try this myself to see if she is pulling my leg. 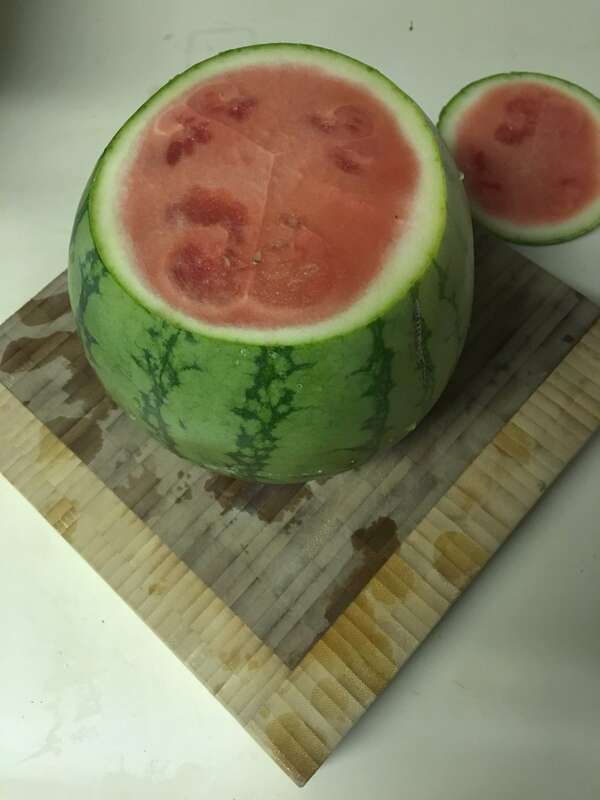 Cut up a seedless watermelon into 1 inch diameter spears. Press the watermelon between sheets of paper towels to get out the excess water. Arrange watermelon on a tray so that no one is touching. That way the air can freely flow all the way around the spears to help them evenly dehydrate. One of my favorite snacks is chili spiced (dehydrated) mangoes with dark chocolate chips. It is lightweight and keeps me going for miles. It occurred to me that I could also spice up my watermelon, so on a third of the melon I sprinkled them with paprika and chili powder. 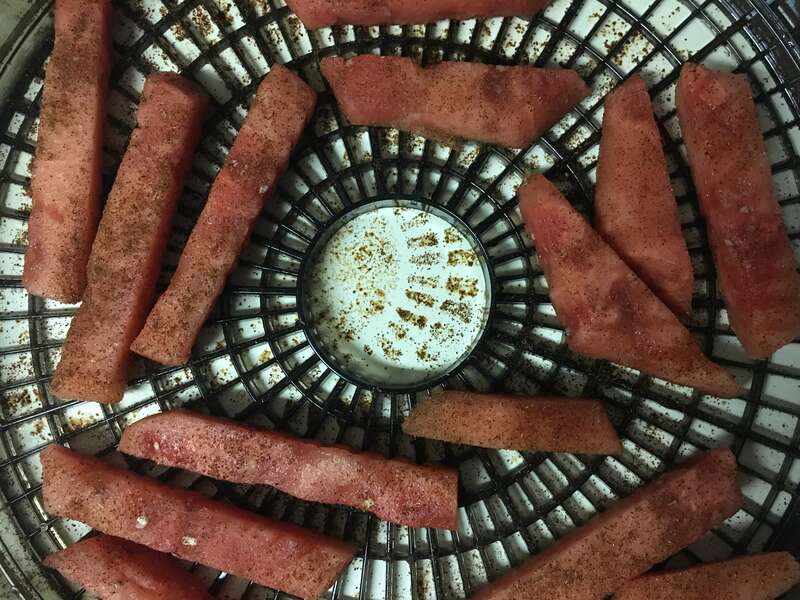 Stack the trays of melon on top of each other, put on the lid and plug in the dehydrator. I didn’t look up a recipe, so I have no idea how long this will take. That’s part of the fun! A quick internet search could give me the answer, but that takes away part of the mystery. 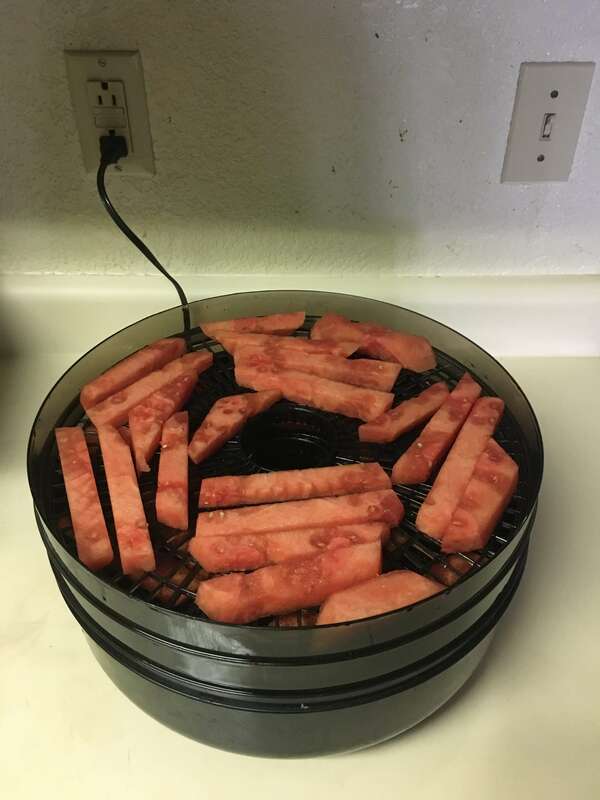 I started dehydrating watermelon at 2:30pm on Sunday, October 1st. I checked them this morning and they have shrunken by more than half! I’m curious to see if this is a farce, like someone selling bottles of dehydrated water. Is Rachel pulling my leg or am I just teasing you? Tune back in tomorrow to find out if dehydrated watermelon is a wonderful gag gift or the perfect, lightweight trail food. Looking forward to seeing how you like it. I haven’t tried dehydrated watermelon yet. I’ve just discovered dehydrating eggplant, which makes making Eggplant lasagna a snap! Did you make up your own lasagna recipe? I am curious as to how I can use dehydrated food in my kitchen for making dinners. This is so cool.. Looking forward to tomorrow. Light weight backpacking um I think I could get into that. Enjoy your journey! Hi Marc! It’s so nice knowing I have one reader from Yosemite. I’m surprised I don’t already know the answer to this question, but do you like to go backpacking? I know you like rock climbing. I am so curious, too. Is dehydrated watermelon for real? Your writing style is fun and engaging. I will be back for the watermelon reveal. And lucky you, you get to taste the fruit in question!